Driving through one of the side streets late one Thursday afternoon a couple of weeks ago in an area that is mainly populated by locals, I noticed a row of lovely (but quite run down) traditional little townhouses and outside, on the terrace of one of these dwellings was a group of abaya (cloak) clad women sitting down in a circle, smoking "sheesha", drinking cups of Arabic coffee (khaiwa) and looking like they were having a ball. Watching from afar, I looked onto this little congregation only for a few seconds - I was driving past, so I couldn't stop, but I was tempted to take a spin down that block again, just to get another glimpse of that charming site. In the absence of a camera, I wanted to preseve the scene in my mind. Weeks later, I am still thinking about that scene. What secret women's business were they talking about, I wonder? (Surely not the complete works of Jane Austen!) And, how long have they have been meeting over 'sheesha'? Perhaps they meet every Thursday? (I don't even know, as I haven't since had the chance to drive down that road late on a Thursday afternoon). 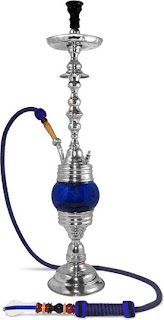 So, some may be wondering - what is sheesha? It's a smoking device that is widely used in the Middle East (in the Sub-continent, it is also widely used and known as the 'Hookah') and it seems to cross the generation and gender gap in the Middle East. You have our charming little women's club puffing away, you get groups of older Bahraini men smoking it and then it's very popular amongst the 20-something set too. But it's not just 'smoking' - I read somewhere that whereas cigarettes are just 'fast food', sheesha is the 'cordon bleu' of smoking - not that that's any kind of honour - it is smoking after all and can probably kill you just as fast, if not faster than your traditional cigarette. There are particular cafes that are devoted to sheesha here in Bahrain (and its partner in crime, caffeine). It can be ordered at a cafe along with a tea or coffee and it will be delivered to your table by a waiter who sets the pipe up next to you with a pile of hot, golden, glowing charcoal. To add to the attraction, it comes in different flavours too - like apple, grape and mango. The aroma of it is strong, but it grows on you. It's certainly one of those smells that I'll always associate with the Middle East. The contraption is quite interesting looking too and can be quite decorative. It's hot now... too hot. But Summer does bear some good news - it's mango season again! Only problem is that my mango man is missing in action. I tried dialling his digits the other day and got a recorded message: "the number you are dialling is not accessible at this time..."
Relating this back to my previous post about a transient expat population... even the fruit wallas come and go! Oh well MM, '09 was our summer, but I must move on.